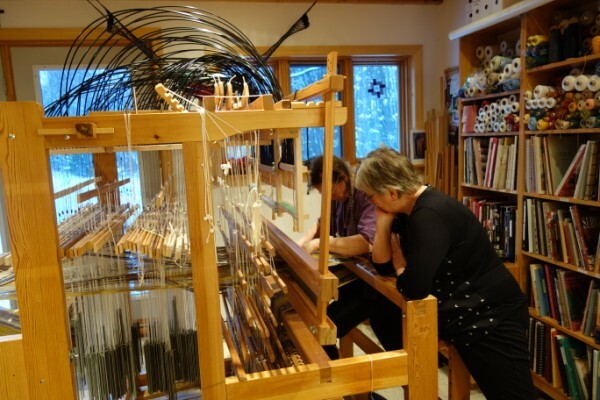 A group of 6 friends and a weaving “retreat”- this had been planned at Complex Weavers Seminars back in July but did so nicely mark the start of a new era post Sturt. I had a week or so of starting to unpack, rearrange and re-establish my studio space. Then I was off to Canada. I thought I’d share this event not so much from the point of view of what I/we did but rather the idea behind it and the management there of. This is the sort of event that a group of friends can easily manage and perhaps may prove food for thought for others. This group has evolved from a week’s class at Vavstuga in 2009 Then a group of friends had got together and organised a “Special” with the theme driven primarily by the group with equal input from Becky. This is the second retreat that has evolved from that, though the first I have been able to attend. So that there’s a tag, we call them “Special, Specials”. Why? It’s a gathering of friends. 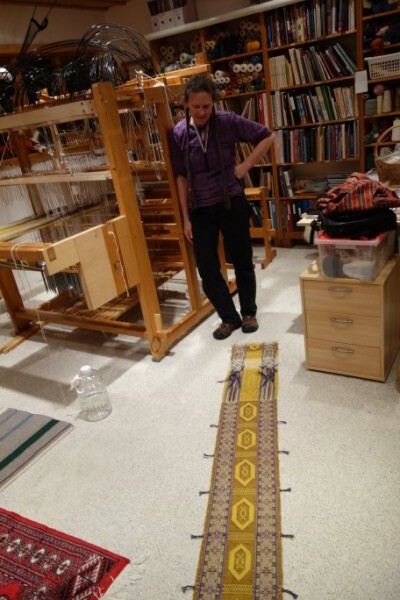 Our group consists of weavers with a certain amount of skill. Many of us have taught. There is a level of freedom in this event as none of us are there to “teach”. We are there to do our own thing, share and depending on what is being explored we will each have different backgrounds to bring experience to the discussion. 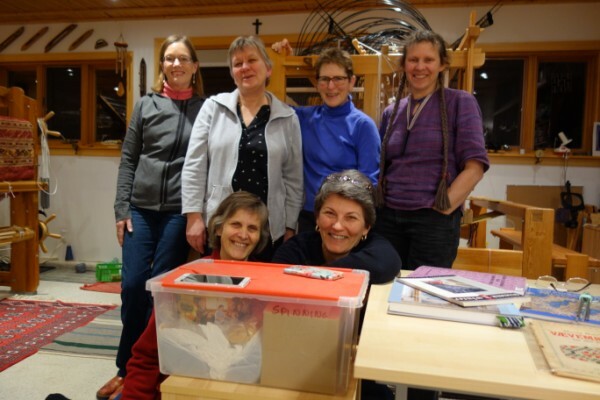 We are all there to learn both from what our own project is and what the group is doing. Discussion is open and free flowing. 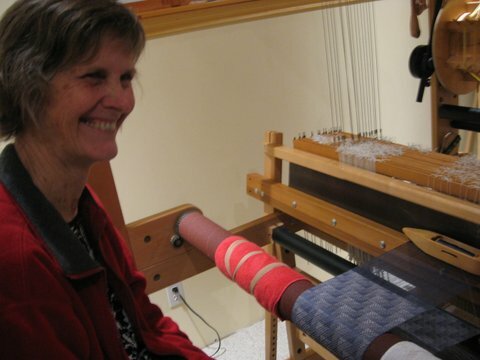 It provides time out from a busy normal schedule to allow time to focus on weaving. It provides an excuse to investigate something you’ve been meaning to do possibly for a while as it really is classed as “play time” as opposed to “have to do weave time”. There is a sense of freedom in that, as the outcome need not necessarily be successful. So the aim is a great group of friends gathering in the hunt for knowledge and having a grand time doing it. Where: In the studio of Jette, Hillsdale, Ontario. 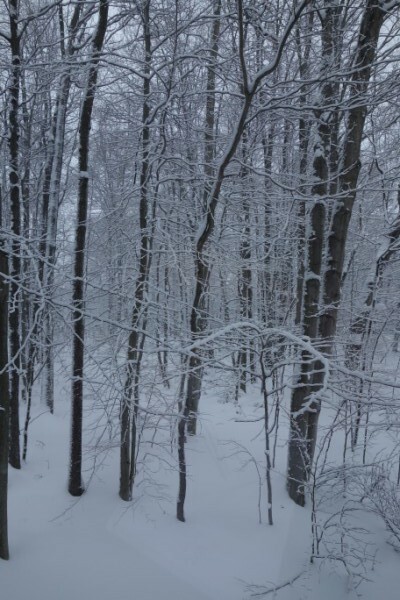 A great destination: I get to escape the humidity and heat of Queensland and experience snow. Being in someone’s studio does mean a level of comfort and relaxation though does have some limitations. 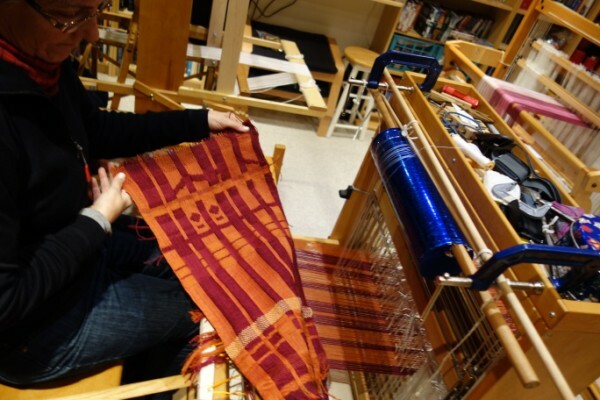 The number of participants and activities of the group are limited by the looms and space available. Because Jette and Bev live close together, accommodation was split. When: 5 days over New Year- 2014/5 though I got to play for about 10 as I had to travel further. The members were: 2 local Canadians, 3 from USA and 1 Australian. Who: The hosts Jette and Harry, Bev, Bettes, Becky, Deb and myself. Harry is most essential in his role of engineering consultant, let alone as “mine host”. As no one person was to spend more time than anyone else in the kitchen, we drew up a roster and nominated meals to be prepared by each. In some cases, meals were prepared at home, in others prepared on site. Cleaning up was a group effort. Our best laid plans were set aside when we had leftovers. They sure did make life easy. Some warps were prepared off site though most were wound on site. We arrived. We played. We wove. We talked. We achieved….. a conversion of an 8 shaft table loom to a “draw loom”, a modification of 8 shaft floor loom into Vietnamese loom, an investigation into how much weight can be obtained on a draw loom, ties and structure (most investigated this in some shape or form but that was accidental), how to use a split shed (several in various guises) and much more. While each worked on their own challenge, it was amazing how many commonalities there were. The most valuable lesson we learned or that was confirmed: the desirability of having time to discuss ideas and to explore an idea. We made sure there was time to toss around what we had done and why we were doing it. Meal time discussion was all encompassing. 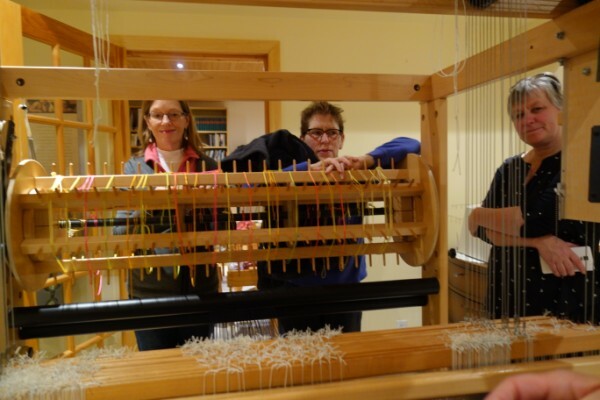 This time we had decided not to swap looms. 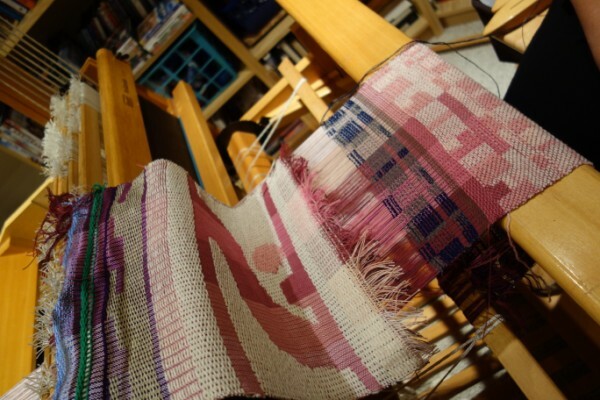 This took total pressure off of having to set up the loom, trouble shoot and to weave. 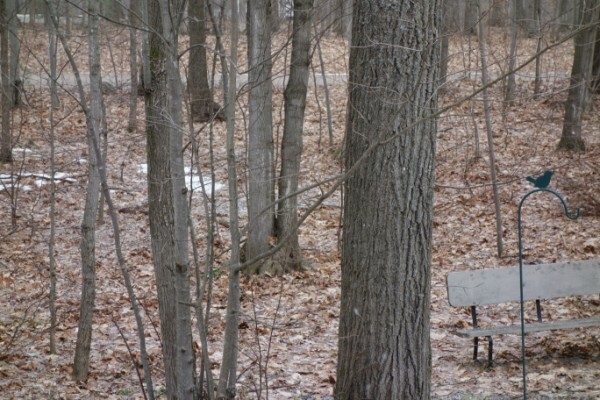 It was great knowing that if you needed a break, you could have one: whether it was just go somewhere quietly and think or to go for a walk or even do some snow activities. It was totally self driven. I came home with some questions answered, more to be explored and some pretty exciting future challenges. This cross fertilization of ideas is invaluable. I must admit that it was difficult to remember to grab the camera sometimes. We were just too busy. 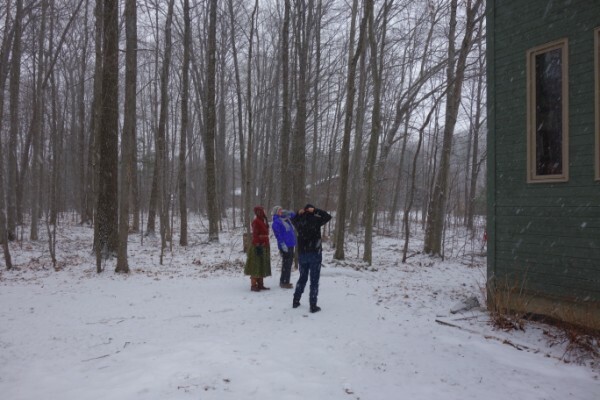 They promised me snow…. BUT where was it? Day 1: the snow arrived. We had a break and went for a walk. How much weight? 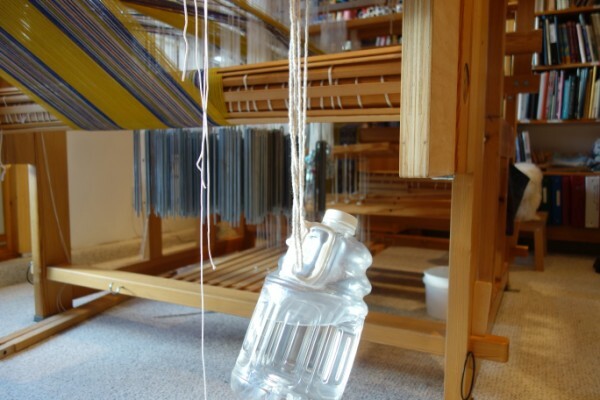 Water in two bottles, lingoes and even more though smaller weights in front of these= a very controlled warp. 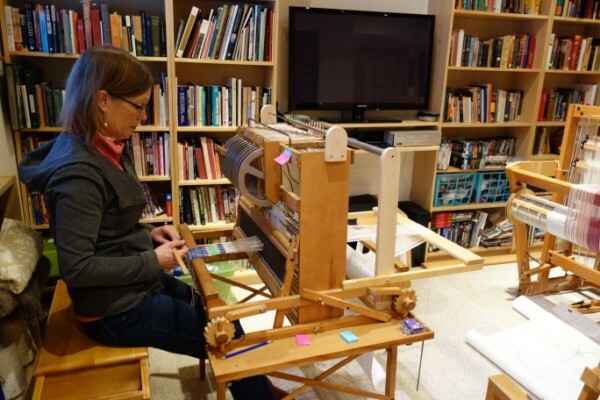 A table loom converted to a drawloom. Photo by Becky. Thanks Becky. Checking out what I’m doing. Deb: Stage one completed. Now to convert to a Vietnamese loom.. Note the blue plastic roller used to store pattern. Becky contemplates. She wins the award (if there was one) for the most hours spent in the studio. She even slept in the studio on the last night to make sure she finished. I missed getting a photo of what Bettes was doing. The first half of our time flew by without a camera to hand. By the time I remembered, she was spending a session with Harry constructing. I came home to a studio which still needed time to sort out. In all, the big reorganisation has taken 3 weeks but now it is ready for when I do start work. It’s a great feeling knowing that it is finished. 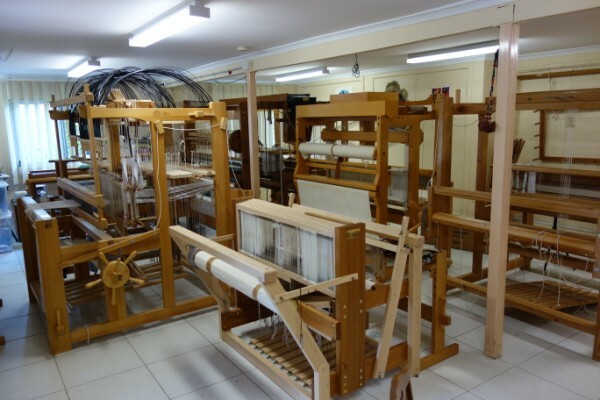 I have now 6 looms in that space: a 24 and 16 computer assist, a draw loom, 2 x 8 shaft jacks and 1 countermarche. I have plans for two others though those plans will be revealed later. One of those involved late night discussion with Harry. You are currently browsing the Kay Faulkner's Blog blog archives for January, 2015.